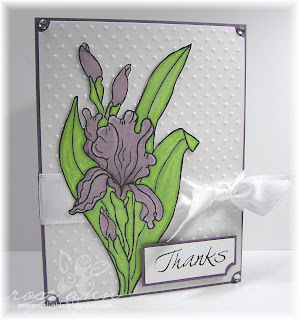 Today I have a card using Big Iris, a gorgeous new image from Starving Artistamps. It can be purchased separately, or on a full sheet of lovely new floral images. For the next week, buy one 8½ x 11 inch sheet of rubber images, get one sheet of original cling for FREE!! Offer is good on all FULL SHEETS by Red Castle, Doodle Factory, and Starving Artistamps. The Iris was stamped with Arirondack Pitch Black, and colored with my Copic Sketch markers. Sparkle was added with my clear Spica glitter pen. The base is Perfect Plum with a layer of Whisper White and Vellum Card Stock. The Vellum layer was embossed with my new Swiss Dots Cuttlebug folder & Big Shot. The ribbon is May Arts. I think everything looks pretty straight-forward on this, but you can let me know if you have any questions. I know all about catching up! I am doing the same thing after CHA--both at home and online!!! This is a beautiful card. I love how subtle the background is with this gorgeous image. Great card!! Love that new Cuttlebug folder! 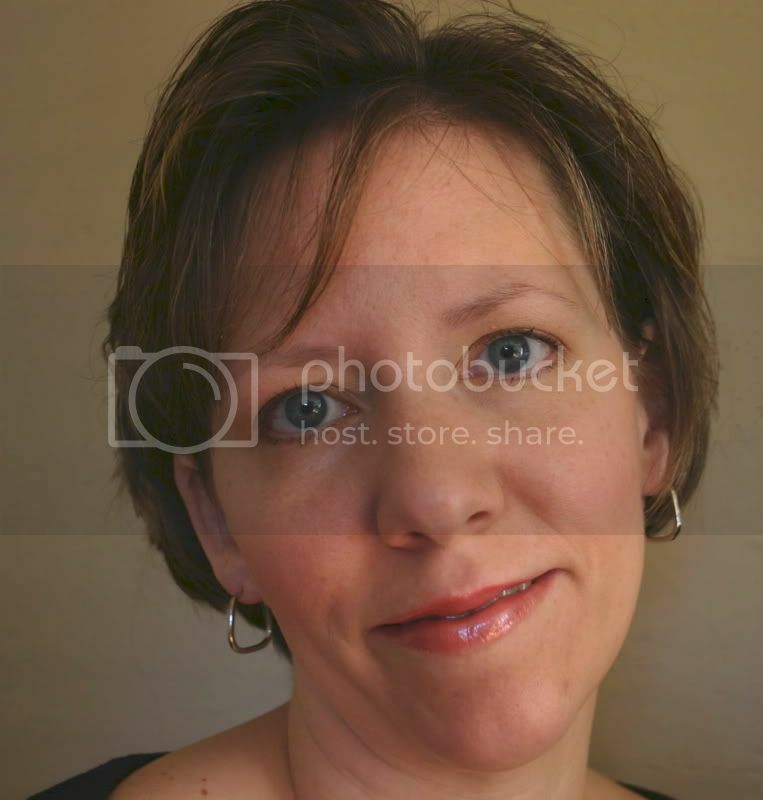 So pretty, Rose Ann! Thanks for sharing! Wow! Beautiful and elegant. I really love the look the CB polka dot folder gives. Mine's waiting for me when we go home. I've also got Adironack Black Pitch waiting. I want to try it with Copics - looks like it works well. Gorgeous card! The Swiss Dot sets off the iris so nicely. So clean and crisp. what a pretty card, Rose Ann! Really beautiful! Love how the background makes the flower pop off the page. It's catch up around here too - long weekened following snow days is just too much! WOW Rose Ann your card is sooo amazing .. Love the purple :-) Such an elegant card LOVE IT! Rose Ann the card is amazing! I have ordered that swiss dotted embossing folder and can't wait for it to get here. This card is gorgeous! The clipped edged on the sentiment is such a great touch. Wow, Rose Ann! This is gorgeous!!! I love how the bright flower jumps off the page! Beautifully done-love the simple background with that amazing flower...you showcased it well! That flower looks so elegant against the white on white embossed bg. such a beautiful, crisp, clean card. I love the swiss dot embossing folder on the white card, it is such a perfect backdrop for this gorgeous stamp! I'm playing catch up too! LOL! Your card is gorgeous!! Wonderful colouring, as always! I am in LOVE with this gorgeous creation! LOVE! I LOVE this!!!!! That cuttlebug BG is awsome, and the image looks great on top. Its a real stunner! very cute. love the swiss dot folder i need to get that one. Beautiful !! Love that flower..
Wow! This is gorgeous! I *LOVE* the big flower on top of the embossed dots! Wonderful sentiment too! Hi, Rose Ann! What a great idea to cut out the whole flower and mount it right on the embossed vellum! I just ordered 3 new folders, but not this one. I love it so much but I heard the dots get squished. I'll be wishing I had it, I'm sure, if I keep seeing beauties like this! This is one fabulous card -- I just love the Swiss Dots folder -- it looks wonderful here -- great way you did the flower -- so love this!! !